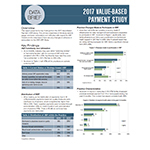 "quality expectations are easy to meet in VBP models"
WASHINGTON--(BUSINESS WIRE)--Fifty-four percent of family physicians indicate their practices participate in value-based payment models and half believe value-based payment models will encourage greater collaboration between primary care physicians and specialists. 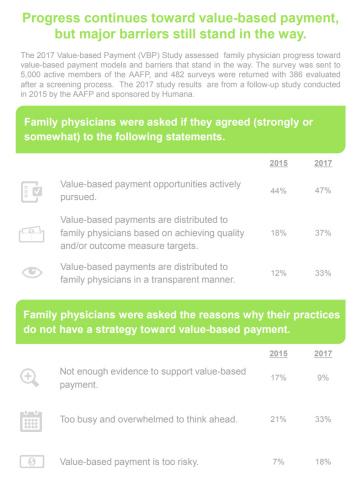 Those are among the key findings from a recent study on physician acceptance of value-based payment. These results are being shared by the American Academy of Family Physicians (AAFP) and Humana Inc. (NYSE: HUM) in a congressional briefing today. Forty-three percent cite hiring/hired care management and care coordinators, compared to 33 percent in 2015. 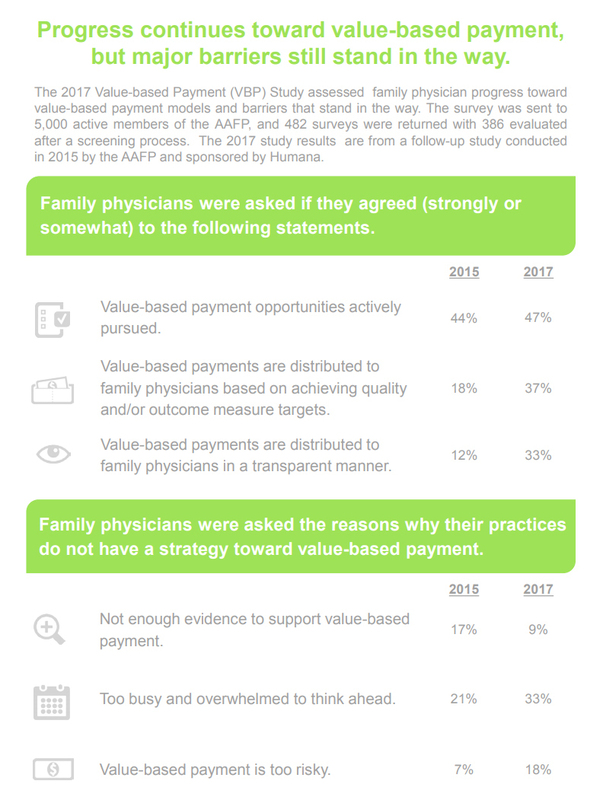 The 2017 Value-based Payment Study was sent to 5,000 active members of the AAFP. A total of 482 surveys were returned, and 386 were evaluated after a screening process. For a more detailed review, click here. Family physicians conduct approximately one in five office visits—that’s 192 million visits annually or 48 percent more than the next most visited medical specialty. Today, family physicians provide more care for America’s underserved and rural populations than any other medical specialty. Family medicine’s cornerstone is an ongoing, personal patient-physician relationship focused on integrated care. To learn more about the specialty of family medicine, the AAFP's positions on issues and clinical care, and for downloadable multi-media highlighting family medicine, visit www.aafp.org/media. For information about health care, health conditions and wellness, please visit the AAFP’s award-winning consumer website, www.familydoctor.org (www.familydoctor.org).